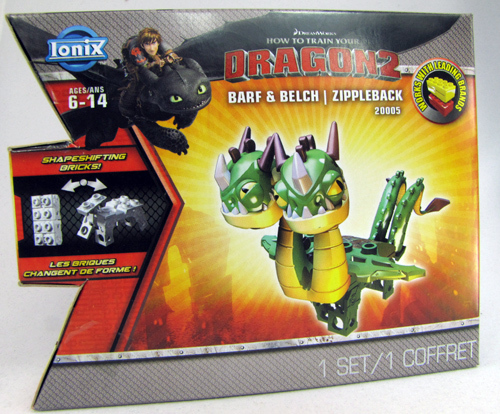 How To Train You Dragon Building sets are made by Ionix Bricks. The Ionix Bricks system feature a shape shifting brick. The main brick is a 2×4 but parts of it are moveable. So you can twist the parts that have the studs on them. Here’s some of their product description. IONIX: the revolutionary line of never before seen construction bricks that change their shape before your eyes! 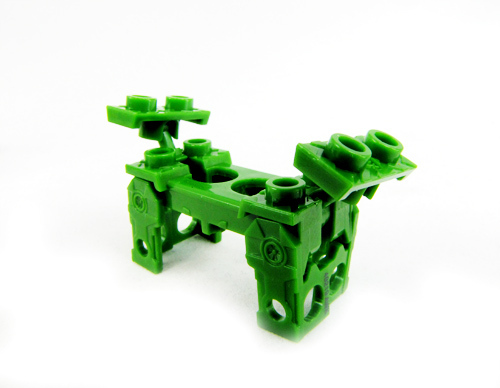 These construction bricks shapeshift and change to become mini figures, action figures, weapons, gear, gadgets and more. What’s more, our bricks snap together with other leading construction systems. IONIX: Shapeshift, build, unleash! 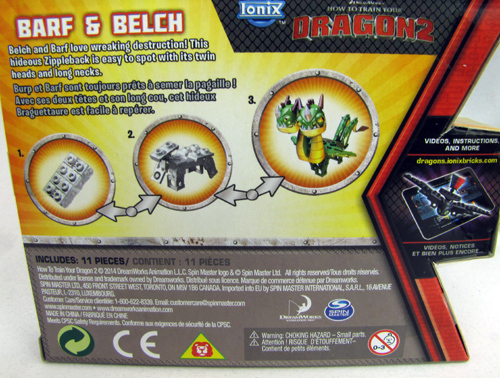 I have seen Ionix Tenkai Knights and even got one of the blind bags to test the premise. Before I could write a post I found The How to train Your Dragon sets. Today I will review one of their small sets, Barf and Belch #20005. Here’s the box you can see a shape shifting brick on the front cover. What the front doesn’t reveal is the number of pieces. The number of pieces is on the back and kind of hidden. 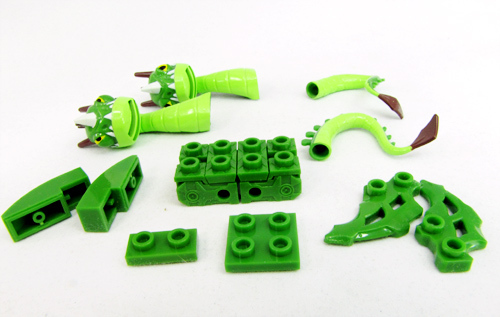 Here are the parts in the set. Eleven bricks, stickers and instructions. The basic 2×4 brick. You can see the moveable parts. Legs out, neck and tail section extended. Adding a couple bricks. Next I added the curved back pieces and added sticker. I didn’t get a good pic of theses steps. Then the wings and tails were added. The final step is adding the dragon heads. This was the most frustrating part of the build.The neck really did want to support the double neck and heads. The weight was too much and they kept falling. This is a neat set. The paint on the head and tails is nice. The fact that the heads were hard to support is a disappointment. I hope that’s not a problem on the other sets. I think this was caused by the long dual necks and heads. I will try to get another set and see. So why not put that is larger print on the box? Cost was $6.99 at Toys R Us. I’m hoping Target has them cheaper. That is a bit much for 11 pieces. 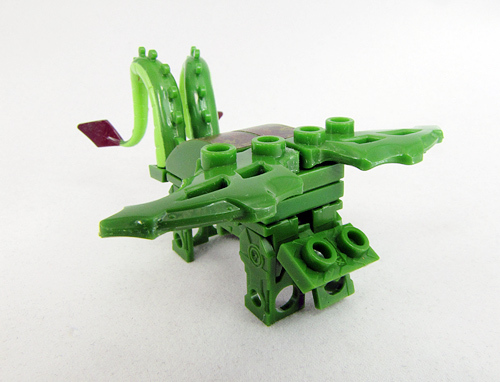 The Meatlug set is only five pieces. It look cool but that’s expensive. I like the shape shifting bricks. 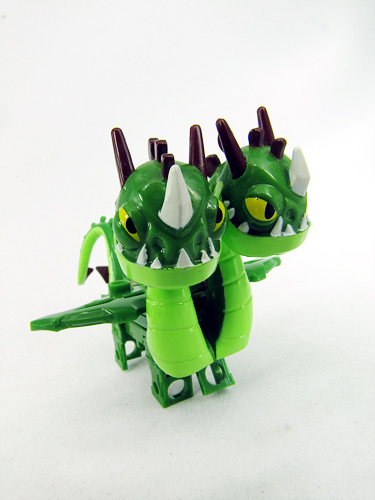 It looks like they are different versions for the dragons. 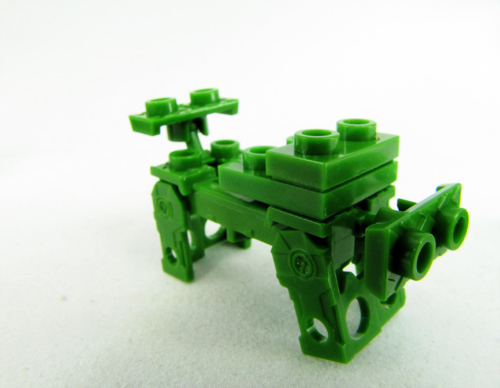 The quadraped form could be used on all kinds of animals. I’m not sure how versatile the biped brick is. It works for the Tenkai Knight robot looking armor but doesn’t look right for Hiccup. 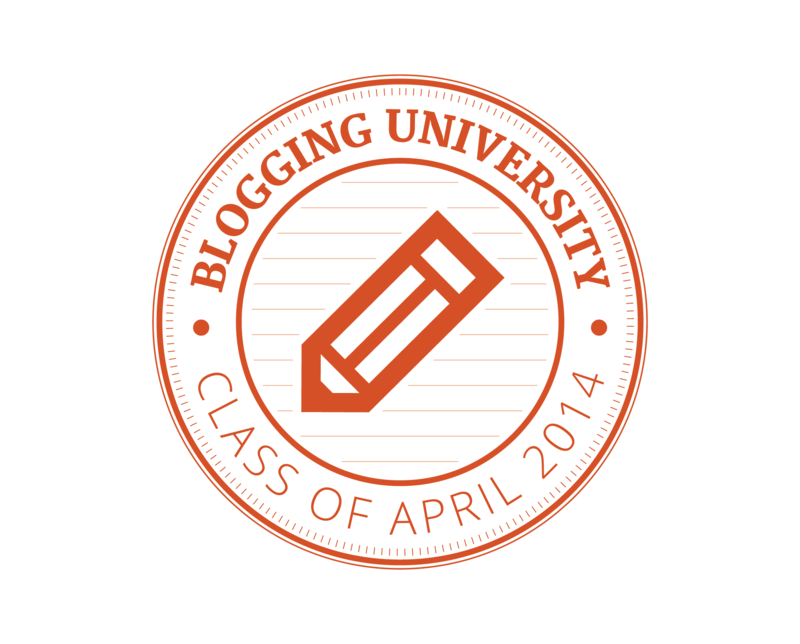 Prepare to unlock your imagination, reveal your inner creativity and challenge yourself. 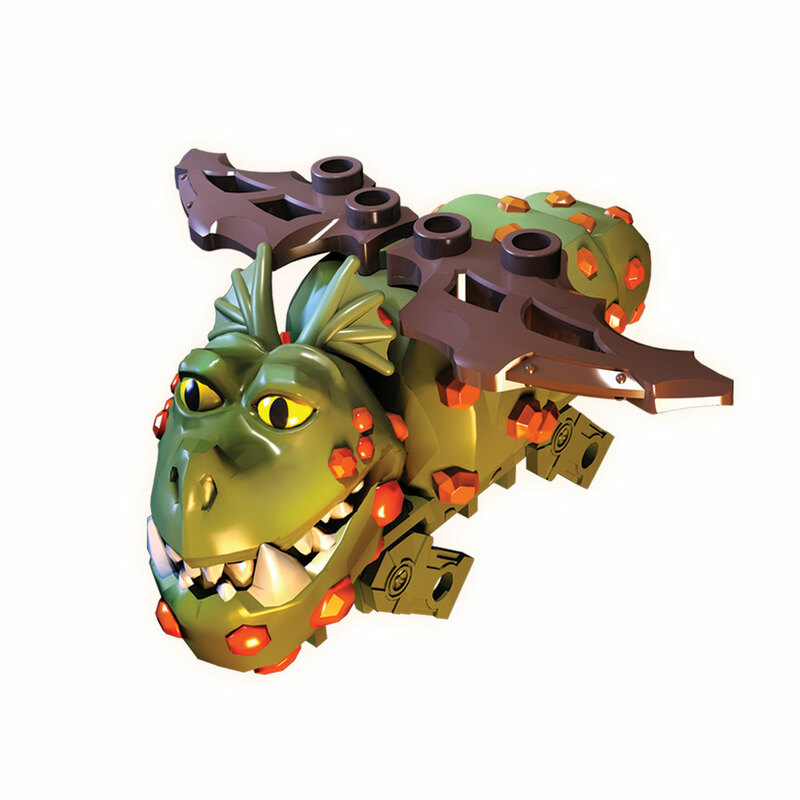 IONIX bricks not only shapeshift to reveal awesome figures, weapons and gear, but they’re also meant to be unfolded, refolded, twisted, half opened, half closed…Think outside the block! UPDATE: I checked the nearest Target today. They did not have any How to Train Your Dragon sets. But They dis have Tenkai Knights sets on sale. The blind bags are $1.99 instead of $2.99 and the carded single figures were on sale as well. At the Deadpool family reunion. Gray deadpool is a custom fig. 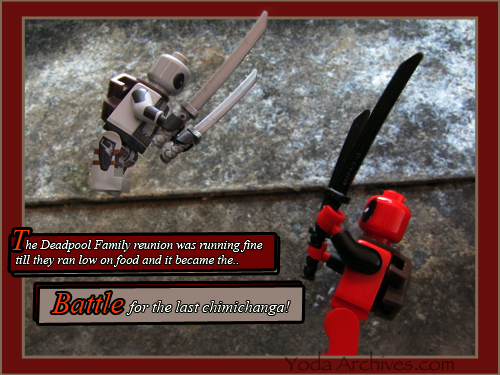 June 25, 2014 | Categories: Action Figures, LEGO, Photography, Super Hereos | Tags: custom figs, deadpool, humor, LEGO, lego super heroes, new comic wednesday, web comic | Comments Off on At the Deadpool family reunion. 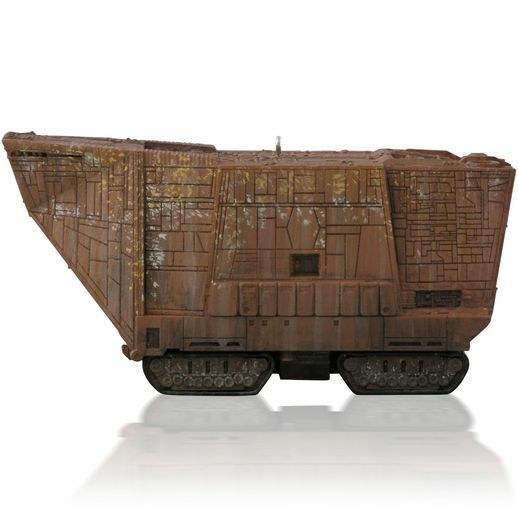 Hallmark Star Wars Ornaments Revealed. 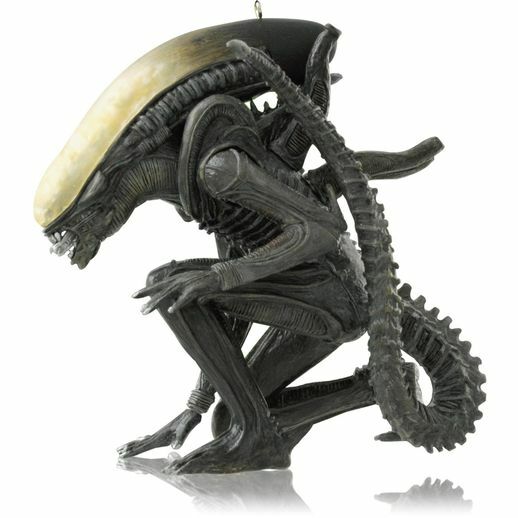 Hallmark has revealed their 2014 Christmas ornament selections. Once again there are some cool Star Wars ones. One is a Yoda peakbuster ornament. This motion-activated ornament will catch peekers and snack seekers. 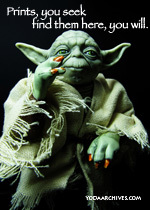 Hear Yoda dish out wise warnings to stay away whenever he senses that peekers have come near. It’s 19.95 and will be available in October. Hallmark begins selling some of their ornaments in July. The following should be in store early in the month. 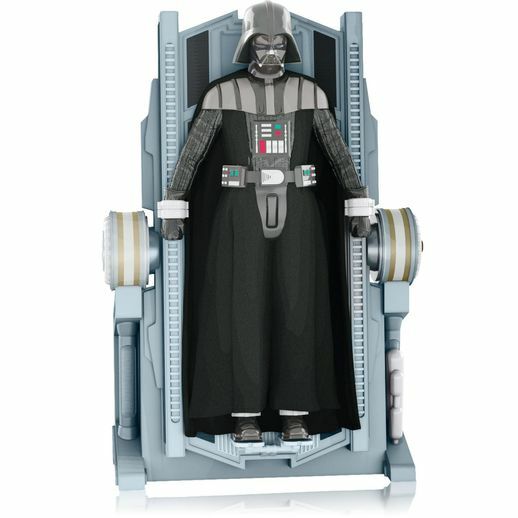 Rise of Lord Vader $19.95 Listen Darth Vader one of my favorite characters but they pick his worse dialogue from the entire saga for the sound chip. If it was just an ornament without sound I might get it. I just don’t think I’ll pay $19.95 for one I don’t want to listen to. 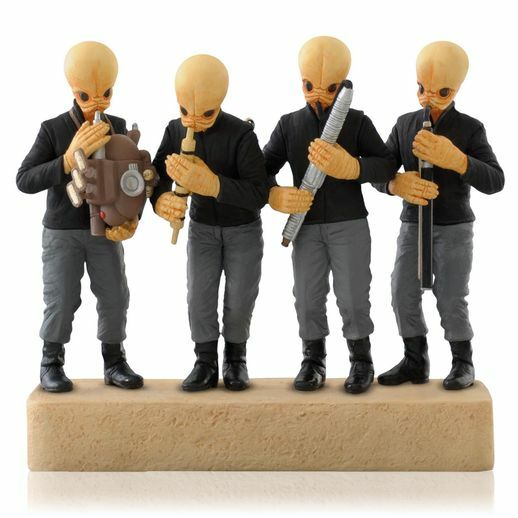 Cantina Band $34.95 Listen Figrin D’an and the Modal Nodes star in this ornament. It’s cool and plays the cantina theme music. But expensive. 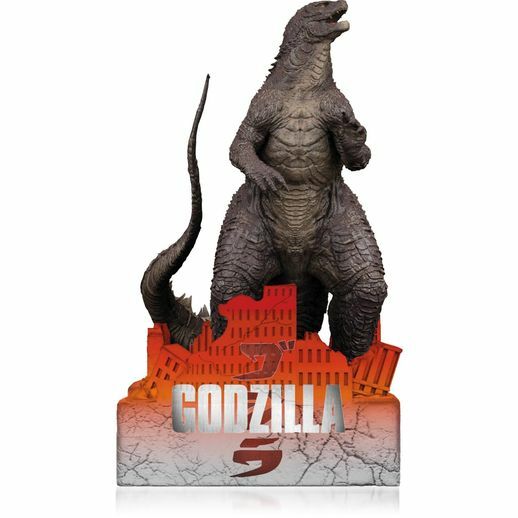 Godzilla $17.95 Listen And Godzilla I might get this one. If you join Hallmarks rewards program they’ll send you e-mail notices of when the new ornaments are released plus coupons a few times a season. Many of these will be released on July 12-13. 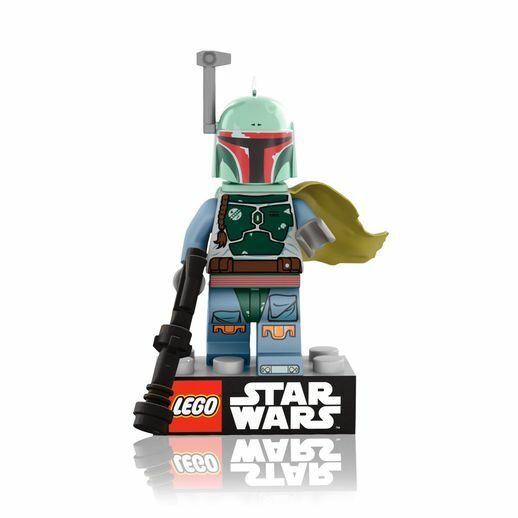 June 25, 2014 | Categories: Action Figures, LEGO, Yoda | Tags: alien, Boba Fett, Christmas ornaments, Godzilla, hallmark ornaments, kaiju, LEGO, lego star wars, yoda | Comments Off on Hallmark Star Wars Ornaments Revealed. 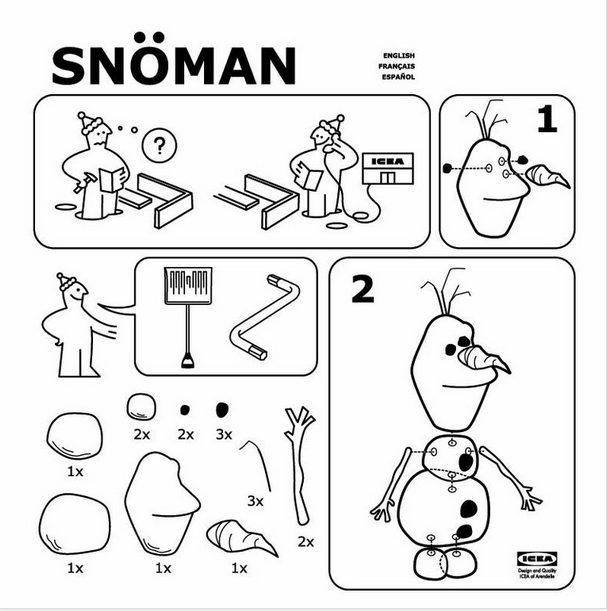 Build a Snowman by Brinkerhoff will be available for $11 at check-out! Toys R Us has announced a free build event for Saturday. Children 5 and older can get a free Optimus Prime riding a T-rex set. My son is still to young for these maybe they won’t ask his age. I was at TRU a few days ago they had a ton of new Transformers toys. They are also having a buy one get one 50% off sale for all Transformers toys. 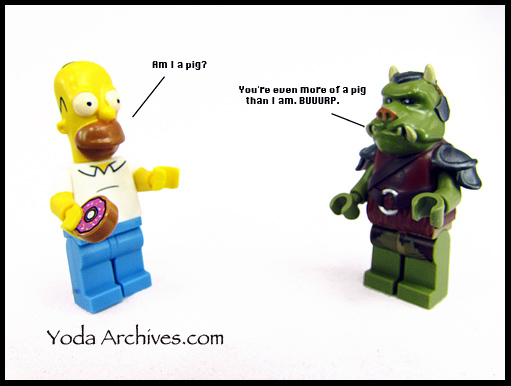 Homer gets an honest answer. I finally found Homer a drinking buddy. The quote comes from the first season of The Simpsons. I had a day off on Friday. I spent part of the day shooting mini figs. I had just download the new images to the computer. Thunderstorms have been in the forecast all day and they finally started. I could hear the thunder outside my office, I glanced out the window and saw the rain falling but not heavily. I spotted the mail truck outside and figure I better get the mail before the rain got bad. I shut down the computer and downstairs. As I opened the door, the lights go out. We just lost power. And where it was light rain a few moments before it was now pouring outside. I stepped on the porch and the wind is blew rain in my face. There’s thunder and lighting but the porch is covered so I thought I’ll wait out the storm. The lights flicker back. Then there’s a Kaaarck as a tree limb crashes to the ground. I watched the rain awhile longer then decided it’s not slowing down so I’ll head back inside. I turn around and there at my feet is the my first Nerd Block. 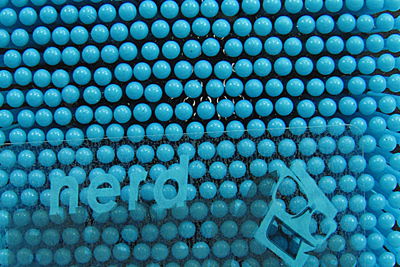 Nerd Block is a monthly subscription service for geeks. Every month, subscribers will receive a package containing a t-shirt and 4-6 toys or collectables. You pick the shirt size but the design and toys are unknown. 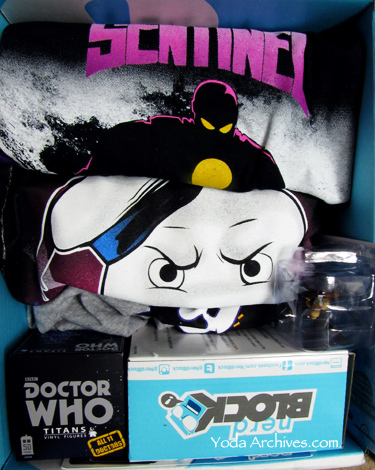 I signed up for the June box because they announced there were two shirts and a Doctor Who item in the June block. 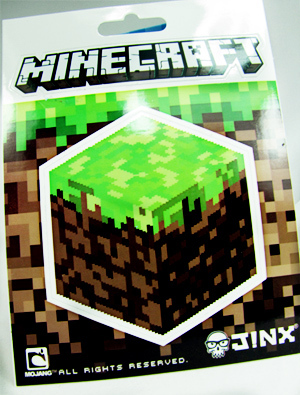 I’ll start with the smallest item, a Minecraft sticker by Jinx. Retail $1.99. Cool if you play the game. I don’t but will pass it on to somebody that does play. Next are the shirts. 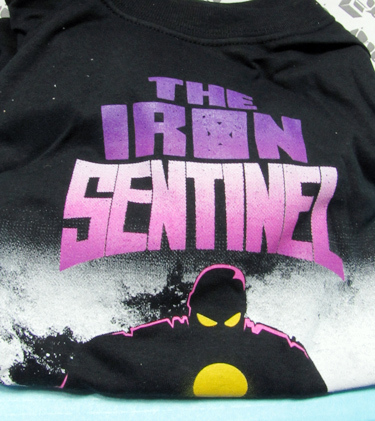 Iron Sentinel and Who you gonna call. Both are cool shirts. 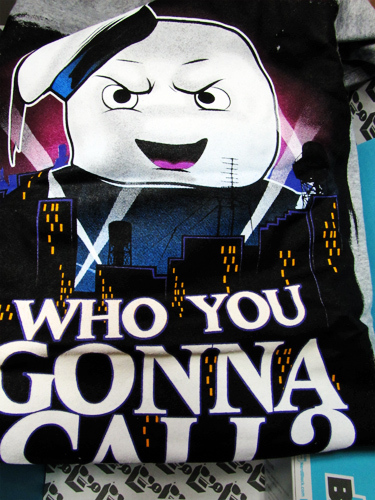 I love Ghost Busters and Giant Robots. Retail $10 each. But the big surprise in this box was a game. 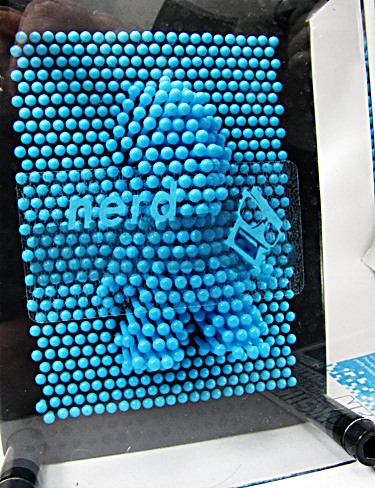 It’s a Nerd Block pin art game. You make shapes and design by pushing the pins. This will live on my desk and most likely appear in action figure photo some day. Here is the Doctor in the blue box of pins. Spoiler alert! If you get a box don’t read the shipping label. There is a mini invoice on it that tells whats inside. It’s vague but may reveal more than you want to know. 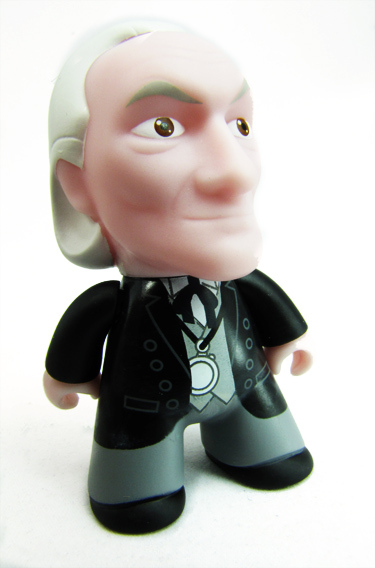 I saw “vinyl figure on mine.” which was the Doctor Who figure. After the unboxing I read the entire label. 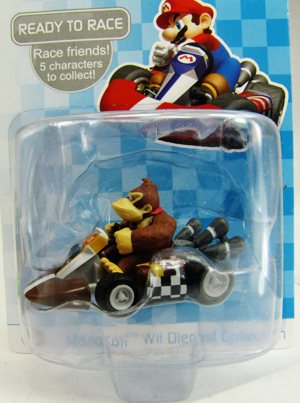 It specfically said Mario cart racer but were listed in generic terms; shirt, sticker, game. Horror block 19.99 Plus shipping 9.50 US, The Horror block ships on the 25th of the month. Subscriptions for July are open. Nerd Block has announced that the block will include two Star Wars items. Yesterday I made by goal of betting last year’s traffic numbers by one view. So one week left in the month to build on that number. I’ve beat last year’s traffic every month so far this year. A few more post planned for today one is a review the other is a new LEGO photography comic. 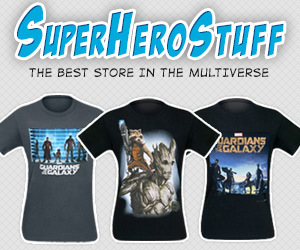 TeeFury has grab bag tees today $6 for a random shirt $5 for kids sizes. Plus a Lego Disney shirt on Wednesday. 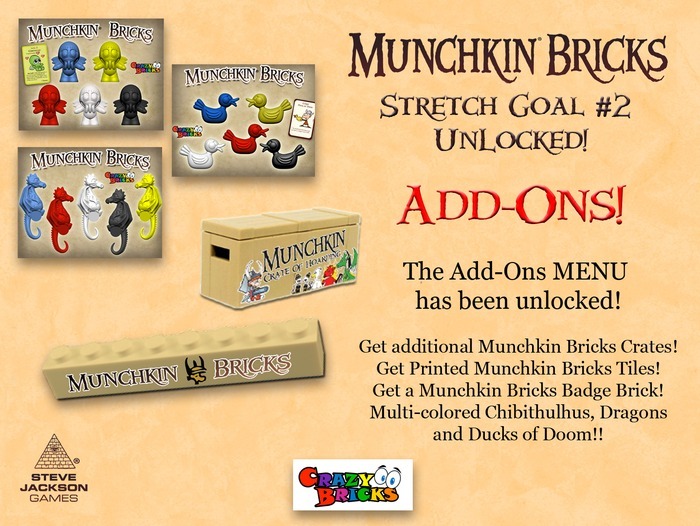 There are just 24 hours left in Crazy Brick’s Munchkin Bricks Kickstarter project. The project funded in it’s first 24 hours. They have a new stretch goal for the last 24 hours. If they hit $55,000 before the end of the project every pledge will will get 2 Random Items in a special KICKSTARTER Translucent Green color and they will unlock an additional COLOR option for your sets! Due to meeting previous stretch goals each set now comes with The Miter, Spyke’s helmet, and two three random munchkin bricks. Plus you have the option if ordering extra Munchkin crates, Munchkin bricks or a multi-color collection of some of the bricks. Munchkin Bricks takes your favorite Munchkin card game weapons and iconic items and turns then into real-life stuff! They fit your favorite miniature figures like LEGO®, Kre-O®, Kubrick®, Character Building®, Si-Dan® and Friends®. Today was a busy day. Unfortunately it was the bad kind of busy. I had planned to photograph some figures and work on the blog today. So photograph were taken but that’s as far as I got. My car tags were stolen plus it was car tag renewal time. I had to spend part of the day getting emissions tested and then renewing and replacing the tag. The tags were due any way but that added extra money to my bill. At least it was quick going at the Clerk’s office. I had to get up early to mow before the heat and storm hit. The yard was mowed and then it was tag time. I grab some lunch and rested a bit. Then I finally got to shoot a new figure and write a couple of comics. I was all set to processes the images, then the storm hit. I shut down the computer right before the power went out. The power was only out for a few minutes but the storm lasted much longer. The storm ripped a couple of branches off a tree. I had to climb a ladder and remove the last stubborn bit of branch the was still clinging to the tree. So I haven’t processed today’s shoots. I doubt I’ll get much up this weekend. So hopefully Monday there be a new one panel comic or maybe even a review. You’ll see it in a few days. June 20, 2014 | Categories: Conventions | Tags: updates | Comments Off on New Stuff soon.